I just wanted to take a moment and talk about the ending of this year, it currently being 9 am on the last day of 2018. Let me just say, the main feeling I am having as it ends is gratefulness. Of course, that change would not have happened if it was not for her and her amazing outreach, and her deciding to bring me on as a mural designer. My schedule is flexible, meaning I get to work on my dream of being a concept artist daily, and have had a great opportunity/ experience working with Reim Entertainment (more on this in 2019, I promise). I was in Wal-Mart yesterday, and thought back to me and the guy first walking through it just after we had signed the lease to our new apartment. I was terrified, unsure if I had steady income. We had to pick and chose what we bought, even a replacement shower curtain becoming too much of a luxury. Yesterday, I went in buying, knowing I had more money coming in. I was able to work in a tea shop for a bit and was able to quit without much worry when it was not working for me anymore. I was able to buy the guy a nice sound system for Christmas. I was able to spend the holiday with my immediate family. I reconnected with my best friend. I have made a point to take better care of myself and know what works best for my body. I drove over 14 hours for two days in a row, cross country, with car full, unable to see out my mirrors to arrive in sunny L.A. without a scratch. Most of all, I can proudly say I am a full-time artist living and working in California. This year has not been without it struggles. Stress, anxiety, depression have all reared their ugly heads on top of financial issues and a lot of uncertainty, but that being said—well, all the risk was worth the reward. In 2019 I hope I have even more opportunity to tread into the unknown. I hope every opportunity is offered so I can take each with both hands. Here’s to another terrifying, tumultuous, riveting, exhilarating, and fun 365 days. Happy New Year. P.S.- who knows. Maybe in 2019 I will make more than 3 blog posts in a year. Something inspired me to write/ think about this today, just because it is something I go through and I know a lot of other creative people go through it—and that is doubt. Doubt has been an insidious participant in my creative journey and everyday life and artists I feel tend to be more attuned to it. I don’t think it’s because we are more vulnerable but we are more honest and aware of our “competition”. I say that because as a visual learner to see someone’s work that is technically “better” than yours causes an immediate categorization of yourself in comparison. It’s similar to a teenage girl and everyone has a Juicy Couture bag and you have a bag from TJ Maxx. Bad analogy, but I hope you get my point. An artist is prone to immediately rank themselves among their peers. This happens in other fields as well, but I think with creative it’s…more present/ accepted behavior. Obviously, this can be extremely unproductive. In my case, I am aware I am my own worst enemy and have been making a lot of changes in order to try to combat this. I don’t think anyone realizes that the quality of work is more often than not a reflection of where you are at/ how you feel. Don’t get me wrong: if I worked at for example a graphic design firm or a job where I had to produce I would do it. And be great at it. It’s the self driven stuff that becomes difficult. More often than not that is why my work sometimes goes through a manic/ depressive sort of flow. When I first got to California I pretty quickly got some work and produced daily. Then we moved into our apartment which was a good 2 hours away from my source of work. Work stopped coming because of distance. In crept doubt and for a good two weeks I found it really difficult to produce anything. I was forcing myself to draw things I didn’t like and wasn’t really making anything I was happy with. Queue the presence of doubt. I went to a networking event and got some inspiration to work: I sketched everyday making those portraits. I revived an old project to get some new material and downloaded Zbrush. Things settled. Where I’m at now: I got a new job and I find it difficult to be inspired again because now my excuse is time and resources. Again this leads to doubt creeping in this time. I am told I need to revamp my portfolio: not a big deal but the weight of it is heavy when you wonder if there is an end game. Point is I feel resistance to it instead of accepting where I am at. A friend asked me today what is holding me back from getting into my career path. Answer? Doubt. On my way home from the gym I thought about this. Why do I believe this is hard or I’m not doing enough? The craziest part is I don’t think I am being hard on myself at all. Basically because I haven’t been actively thinking “Oh that’s crap” or outwardly critiquing my work. It’s an engrained sense of unworthiness. I know it’s been there and it’s shared by many of my friends. At this point, it’s the only thing holding me back. It takes me forever to update this thing, but I have been super busy. Like I said back in January, I was to move to California and I am happy to announce I am now living in Buena Park, CA as of last month. The entire trip was kind of nuts. In Feb, me and my guy loaded up both our cars and drove in little shuttles from Chicago land for 14 hours to get to a little place called Shamrock, TX. We stayed overnight and then went another 14 hours to get to Las Vegas, NV to stay with my parents. After recuperating and fixing a broken windshield that cracked during construction somewhere in New Mexico, we drove another 5 to get to Lake Balboa, CA. We stayed there, just north of Hollywood with some very generous family members for a few weeks while we finally locked down an apartment and settled in (if you are reading, we are forever in your debt). Since then, I have been so blessed to have gotten a line of commissions that helped us out for sure and was great in building my portfolio. We also survived buying a new car as well as me adjusting to a new diet due to health reasons. I also have found a job to make money while we continue to seek out career employment (in which I worked 63 hours my first week of the job). A lot to squeeze in to a few months and a lot of transition, but as things begin to settle I feel so happy we made the decision. I have my little desk and my time, and I am refreshed and moving again. I am producing more than ever and have a lot of ideas and a whole line up of new pieces for a concept I have been working on since 2016ish. Hopefully I will do better with keeping this up to date--it's been interesting to watch this all evolve. Got to do watcha got to do (Happy 2018)! Once again, I follow the trend of not updating my blog consistently. But I am back once more! As a lot of you know, it is currently freezing in Chicago land, it being -9 F as I write this, and my toes are freezing. However, it won’t be like this for long. I haven’t gotten around to announcing it here, but I will be moving to L.A. in the beginning of March. That’s right, March. March 10th to be more specific. So pretty much in 2 months, which is crazy to think about. It’s something my partner and I have discussed a lot about, and we made the decision to just do it. Yes, we are prepared to live in a show box and sleep on an air mattress for a while. It comes with the territory, however we both feel if we don’t do it now, the move is never going to happen. Thankfully my family has moved as well, so us moving will put them at 4 hrs away from us vs a whopping 22. There’s a lot to be grateful for as these things fall into place. I have been working on a lot over the past few months, and a lot I am not allowed to show due to contracts and respect for my clients, but there is always a lot more. Now in addition to my full time job, I will be taking on the daunting task of resume and cover letters. From there, selling furniture and signing papers for a new apartment and hopefully a new job. Then it’s seeing people “one last time” before we leave. Any love or support comes greatly appreciated and not unnoticed. I will attempt to be more consistent with updates given that a lot will be changing very quickly. I am actually updating in a timely fashion, what a concept. I thought it important to go over the shifts in what is occurring at my end. On a day like today, I wouldn’t normally do art. I know, shocking, but I feel as though I have been taking that route of not contributing to the things I want to be doing because it’s “easier”. Just as it’s easier to order fast food instead of cooking. Today, for example, I worked a full day, my full 8 hours in a position that requires me to constantly push my boundaries and go outside what is comfortable for me. Obviously, this is tiring, and I feel because of this everyone has given me a pass to let things fall by the way side or allow me to get to them in my own time. However, this is not a way to approach a passion. This was something that was consistently pressed on me during my time in college, but something I couldn’t fully grasp until now. Recently, my significant other ventured back from L.A., a place he and I are planning on moving for our careers. He was filled with anxiety, but also a new drive and determination that I found I had been missing. I remember all those feelings from art school and the energy that surrounds it. Watching him put his nose to the grind stone, set dates and take responsibility for the trajectory his life is going has been a helpful reminder of the feelings I have misplaced. So here, today, after an 8 hour work shift, and after special requesting that I didn’t work late into the evenings on Monday nights, I am here, sitting down with my notes and making progress on the video game that has been in the works for a few months now. I feel sick, I don’t feel up to the task, but I am making some coffee and writing a blog post with new found intention. That being said, I am hoping to make an official announcement at the end of August, revealing some details about the game as well as the name (and possibly a developer that I am working with to make it the best it can be). Also, be on the look-out for some live stream dates. Since my employer was nice enough to grant me some consistent time for creation, I think it might be a good idea. Feel free to contact with me on any of my social media. Well, it's officially been about a year since I graduated college. In reflection on this, I realize I have grown in places I thought I was secure in, which has inhibited my progress in other places. I began a relationship, got full time employment with benifits, moved out of my house, and begun adulthood and everything that comes with that, including overcoming the scaring that my final year of school left on my inspiration. Even in begining production of an indie game, progress has been slow due to life shifts that I expected myself to take in stride. I expect a lot of myself, and this year has taught me to be gentle, but not undetermined. Now that I feel I have a hold on some things, production of my game will begin snow balling, hopefully having something close to a final product by this coming winter. I am happy as well to announce, that a best friend and creative partner I lost contact with will be joining me on this endevor. I thank all of you for your unrelenting support. I needed this time, and am happy I have had it, and am ready to begin producing again. Wow, has it really been two months? Yeah, two months to the day since I have updated here; that seems crazy to me. But I figured I owed an update to those wondering about my recent missing in action behavior. Things have been going pretty well considering the craziness that has overtaken my life. The biggest update being that I started a full time job late last month. Not in the field I went to school in, but it is paying the bills and is making the idea of moving more feasible. I cannot say enough positive things about my current job either. Corporate is a welcoming environment, one that constantly encourages and pushes us to reach are full potential in and outside of the job. Needless to say, it has been a transition, however not one I've been disgruntled about. Work hours are crazy, changing day to day, and I get one day off a week which allows minimal time to take care of daily challenges, extraneous challenges (like my car breaking down twice last week), and most important of all--art. Do not be alarmed. This has not dissuaded me. I feel that I have had my transitional period. What I am finding now as that the busy schedule is keeping me up, active, and more likely to do other things. I have also made some awesome business connections--one in particular I have been doing art for that I cannot update on social media for copyright reasons. My other projects are also still pending--again, not forgotten, and hopefully these I can pass along as personal projects and portfolio items. All in all, things are crazy, exciting, and changing quickly. At this point, I have a game plan and have eliminated most other distractions. I intend on keeping this creative and progressive stream flowing. I hope you all are doing well, and I would encourage you to check out all my social media. Thank you so much for the support and I am hoping you are just excited as I am. I am sure a lot of you have noticed I haven't been posting a lot of art recently (although I'm not sure how many people actually read this section of my site). Despite my best efforts, I have realized how out of balance things are around me and inside me. Every one of us struggles and have their own challenges, and while I am not going into detail here about mine, I do think it's important to chronicle my changes as an artist and a person as I attempt to be accepted by the art community. As a side note: I am not telling anyone what they need to do in order to be happy. You should not follow my model. Do what's best for you. While one might think it's not a big transition from college to the working world with scheduling, it prevents me from doing my art when I want to do it. I have to force myself to produce in a home environment where my parents and sibling are constantly running around and working off their normal schedule (nine to five as I like to say). There's no such thing as all nighters in my house. If I am completely honest, when I get home from work, the last thing I want to do is draw. I am drained. I have taken steps to correct this in myself. I bought a planner that I have been using regularly, journaling, marking my daily successes and setting realistic goals. For over 2 months I have been telling myself "get x, y, z accomplished". The fact of the matter is something in my make up is different. I have a hard time doing the things that are normal rituals for most to take care of themselves. I am a hermit while I do art, I do nothing else including looking after myself, but the art gets done and it's something I am proud of and then I pick up the pieces and start the cycle over again. That process is unlivable in the real world. But that's the thing--it worked in school. I thrived in school because I had the ability to perpetuate those habits. In reality, I would go so far as to say they were encouraged. In addition to the bad feelings that come from not producing art, the constant rejections and lack of help from anything/ anyone close to what I am doing absolutely amazes me. There is a coldness to every email and encounter--not encouraging new and upcoming creators. The shuffle of hoping if you talk to person "A" your info might actually get to person "J", that will actually hire or even look at your work. I always knew it was going to be difficult, but I am discouraged by not only myself, but the failures of art school that did not set me up for success, and the artistic community. The past few months have taught me things come with time, patience, and hard work--but none of that is possible without proper self care. So, I'm putting myself first. Getting organized. Getting motivated. Getting better. In all honesty, I am happier than I have been in a long time. Maybe the happiest, but that doesn't mean that there isn't room for improvement, and taking steps to fix the things I can (while it might not be artistically productive) will help in the long run. I guess what I am trying to say is take care of yourselves. It's more important than you think. Happy June Everyone! I hope everyone has been enjoying the beautiful weather. It's amazing to me that I am already getting a tan. So, what are we up to this month? In my personal life, a lot has changed the past few weeks and I couldn't be happier. The change is welcome after the amount of stress I suffered through finals. It's nice to feel like a few things are coming easier. As for my art, I have pretty much given myself over to the fact I will have to keep working in order to get to where I want. Thankfully, I already have a lot of ideas. I have actually decided to do a visual development personal project depicting the legend of King Arthur as told by Morgan le Fay/ Morgana, and have done some study pages. Currently I am working on her character design and I am so excited to say that there is a lot of material out there already. The story and characters are so rich I really think I will be able to make something magical out of this. Expect updates regularly but maybe not so many "in progress" captions just because I want to do a big dump of all the developments. In other news, I sent out my graduation announcement this week. Vista print did an amazing job! You can check them out of my Instagram and Twitter, and possibly Facebook page later this week. I think that's about it for now. Here's a treat though. Here is my Morgana visual study page and where I am taking a lot of my influences. Hope everyone is doing well and don't be afraid to contact me! Tous les mêmes et y en a marre! This week has been very exciting for me. I had a lot of interviews for different jobs to keep myself afloat this summer, with a lot of success. I have not decided quite what I am doing yet, but that will come within the next few days. I also did a piece! Not exactly concept work, but I wanted to experiment with some tools I don't use very often in Photoshop with a lot of success. I even made a pattern which is normally done in vector, but I found a quick and easy way to do it. It also happened to be a fan piece for an artist my sister introduced me to, Stromae. I ended up joining a fan page and the piece has gotten some traction which I am super grateful for. I loved seeing everyone's reaction to it, and I'm really happy with the piece. I will be adding a new page for pieces like this and other experiments, but I'm not quite sure what to call it yet. I also set up some social media which I will be adding to my Contact page if you are interested. I so appreciate all the support that everyone has given me. It's been incredibly humbling. As for living back at home everything has been great and my family is continually making me laugh. I even got my sleep schedule on track and have begun drinking green tea in the morning. Plus, having my puppy Latte with me every morning helps with my mood. And shout out to my mom who has a birthday tomorrow. I'm going to really make an effort for this level of productivity to continue as I begin to work, improve myself, and my art. Thank you all again for the love and support. Graduation has happened, and I have to say it is a strange feeling. The amount of stress involved in this transition was insane and I can't begin to describe the self-care I have had to shove into my system to help my recovery from it. I think I pulled two all-nighters in a row in order to make some of my best work. I have always said I am best under pressure, and I suppose this is proof. This past week I have had some nice time to kind of chill out and figure out what I expect of myself for the summer. Currently what is forefront of my mind is to get a job. Obvious, right? Well, I really don't care what it is at the moment. Just a job to make some pocket change as I apply for the field I really want to be in. Second is moving. I have lived in the same area all my life and I am ready to move, as is most of my family; both of my parents being in transition as my dad just retired/ got a new job (I don't get it either). Really, it looks like most of the industry is in the L.A. area which will be a big change from my Illinois upbringing. Even more of a change is where I really want to end up. England-- Long live the Queen. A lot of people might know this about me I spent a semester in Oxford studying Shakespeare. In all honesty, I fell in love, and ultimately that's where I see myself settling down and starting my life. Yeah, far in the future, but the sooner I get there, the happier I be I think. However, I won't turn down anything that will help me get to where I want to be. It's all so scary and unsure. I have a lot of projects in mind to help me move forward in my short term and long term goals--and I have a feeling if I wok hard enough I'll get to where I want by the end of the summer. I'll be setting up a shop soon so ya'll can by prints, and there will be a picture of my beautiful business cards attached. Tomorrow is the day I turn in my printed portfolio for edits. I have been working really hard this weekend and actually ended up scrapping an entire piece I had begun months ago. It just wasn't salvageable. I think being able to know when something isn't working is a real talent for an artist. As a result, I was able to do something a bit faster with 100% better quality. It's weird to see how much my work has shifted in a short time (not that I'm complaining over the obvious improvements). In other news, my business cards came in and they are gorgeous thanks to wetheprinters.com--and they came so quickly! I will be posting a pic of those at a later date. As for now, it's back to work. Graduation is drawing near and I am working hard to get to where I need to be for my graduation show on the 7th of May. 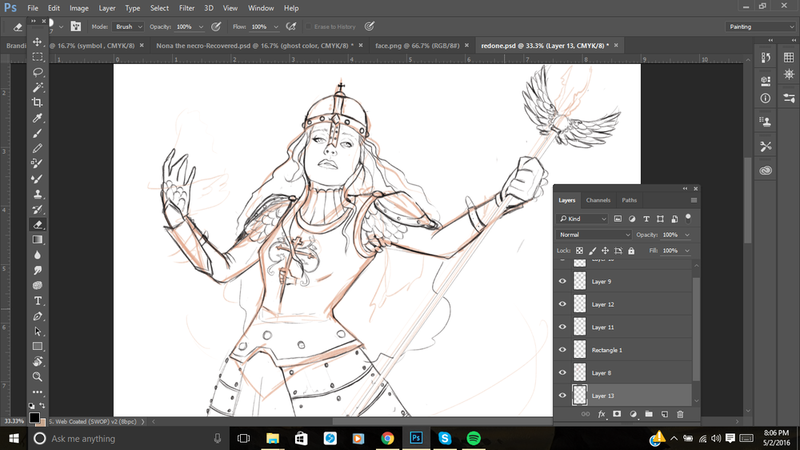 I am in between a lot of pieces, but I am extra excited about this witch I am drawing out! I will be posting some other WIPs soon as well, and some finished products here soon. It's been extremely stressful. Today is the first day my website is live, and I'm very excited. To kick this off, I want to share a bit of my process, so enjoy these in progress screen shots.